River Rafting near Sacramento – YES, and only an hour away! Within an hours drive of the greater Sacramento area, you can find 3 american river rafting adventures on the 3 different forks of the American river. 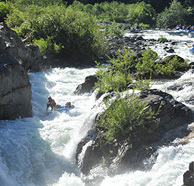 On the Near Sacramento, you can find just about any level of rafting that you could ask for. 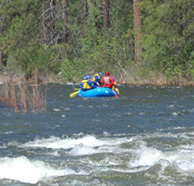 From the mild to the wild, river rafting near Sacramento can be super fun, exciting, and for the whole family. 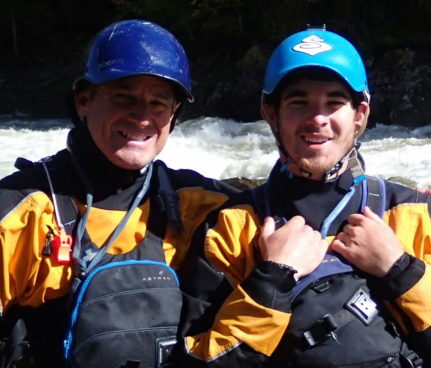 Float trips with bouncy class 1 and 2 rapids are great for families with kids as young as 5 with our South Fork American river Young Rafters Adventures. Or adults with older kids, try our class 3 section of the South Fork, which is perfect for first timers and experienced rafters alike. Stepping it up a little, the Middle Fork American river offers some of the best class 3 and 4 summertime, hydro-dam controlled rafting in the entire state of California. River rafting Sacramento at its finest! Experience the famous “Tunnel Chute” rapid that was formed by gold miners back in the 1880’s. There is not another rapid like this one in the world. We offer 1 day trips on this 18 mile section of river. Deep canyon, very isolated, and super beautiful clear water make this trip a must for adventurous rafting enthusiasts. 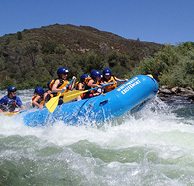 2 or 3 day Sacramento rafting adventures on the American River are also a great hit among those wanted to have an extended stay and camp out with us at our private, wonderful riverside camp area, right on the banks of the South Fork of the American river. We include 2 nights of camping and 5 meals with each 2 day trip. Try our special Tues/Wed Super Ultimate Middle / Middle Combo for the most rafting in a 2 day period you can find. For more information on river rafting near Sacramento, please give us a call at 1-800-750-2386 or book online right now at the links below!